All Noise Control Soundproof Office Windows are the most cost effective and expedient solution to eliminating unwanted noise in office setting, even when the noise comes from within your building such as an entryway. When the sounds of the city become too much to work in peace, a ANC Window is the perfect solution. We fit our custom made ANC Window into the existing window opening in a very short time without permits or building management permission, making your office or conference room free of unwanted city noises. To understand how different types of soundproofing foam can be used, one must first understand how sound waves and noise levels are measured. The ability of an object to block sound is measured by its Sound Transmission Coefficient (STC) rating, which can range from 0 to 100. A wall with a STC rating of 50, for example, means that noise levels on one side of the wall are 50 decibels higher than on the other side. Sound absorption is measured using the Noise Reduction Coefficient (NRC), which generally falls between 0 and 1. This number shows the amount of sound absorbed by an object, and the higher the NRC value, the more noise is absorbed. Noise Control & Soundproofing Solutions by All Noise Control are comprised of premium acoustic products that encompass materials that deal with noise control problems through noise absorption materials and materials. We are manufacturers & major suppliers of various noise reduction and acoustic materials used for soundproofing, sound dampening, sound deadening, sound insulation & noise control purposes in multiple applications. All Noise Control, Sound Absorption product experts in Florida, announces the launch of their new White Noise Sound Masking Desktop Unit. The All Noise Control White Noise Sound Masking Desktop Unit is the most sophisticated unit of its kind for providing speech privacy in home offices, small waiting areas and for locations where it is difficult to install sound masking in the ceiling or plenum. It helps create speech privacy by generating a comfortable background sound. The Desktop Sound Masking Unit consists of an individual self-contained noise generator, audio amplifier, loudspeaker, and power supply unit in a white damped metal enclosure. It is powered by an internal transformer with a 120 VAC plug (Plug-in can be configured for international use). Adjustments can be made by a small screwdriver (provided), to the contour and volume control. All Noise Control, Soundproofing product experts in Florida, announces the launch of their new In-Plant Acoustic Blankets & Noise Control Enclosure Products. Soundproofing All Noise Control In-Plant Acoustic Enclosures are an incredibly versatile acoustic solution for industrial/manufacturing type (in-plant) applications. All Noise Control, Soundproofing product experts in Florida, announces the launch of their new Soundproofing Blanket Hardware & Hardware for Acoustic Curtain Systems – Model Track & Framing Hardware. All Noise Control, Sound Absorption product experts in Florida, announces the launch of their new ceiling clouds acoustical material. All Noise Control, sound damping ANC-WB21 Loaded Vinyl, Composite Noise Wrap Barrier – Acoustical Pipe & Duct Lag-Series, A composite material featuring a flexible one pound per square foot reinforced-foil faced loaded vinyl barrier bonded to a 1″ thick quilted fiberglass sound absorber. This product is use to wrap noisy pipes, ducts, valves, fan housings and more. All Noise Control, soundproofing Acoustical Ceiling Baffles, in any shared environment, Ceiling Baffles can create a warm, colorful atmosphere while providing the maximum in acoustical control. Fewer distractions in open offices or institutional settings, greater privacy in restaurants or hospitals can all be achieve easily with Baffles that incorporate state-of-the-art technology and artisan ship. 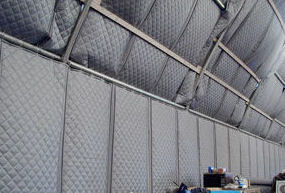 All Noise Control, sound deadening Acoustical Wall Panel, offers maximum sound control by blocking the transmission of sound energy and damping vibrations. 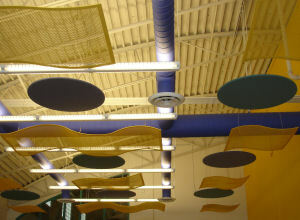 The goal for All Noise Control is to inform customers about the Acoustical Wall Panel. All Noise control introduces new line of QuietFloor underlayment product! All Noise Control the leader in sound control products for over 15 years, proudly introduces Quiet Floor acoustical floor underlayment. QuietFloor is an innovative sound reducing underlayment for ceramic tile, natural stone and marble flooring that also acts as a crack suppressant.